It’s almost trick-or-treat time! 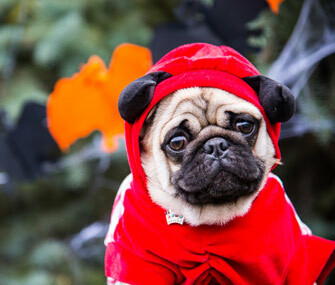 You’ve got your pumpkins out and your candy ready — but is your pet prepared for Halloween? Not all dogs and cats relish this holiday. For some, wearing a costume and greeting neighborhood kids is a fun way to spend the night. But others may be uncomfortable getting dressed up, or nervous around people, or terrified by the doorbell. Consider your pet’s personality when you’re deciding just how much spooking is enough. Here are a few simple ways to help make Halloween fun for everyone and some easy tips for dealing with dogs and cats who just aren’t that into the whole thing. Costume with care. Lots of us get a chuckle out of dressing our pets up for Halloween, but this takes planning and patience. Buy the costume well ahead of time so you can make sure it fits comfortably — it shouldn’t restrict your pet’s ability to move around or breathe — and that he doesn’t mind wearing it. Check to make sure it doesn’t have buttons, bows, fringe or other items that are easily chewed off and swallowed. And never leave your pet in costume when he’s unsupervised. If your pet just isn’t into dressing up — if he resists putting his costume on or struggles to get out of it — let him join the party in his birthday suit. You can also opt for a Halloween-themed collar for a little festive pizazz. Find a pet-friendly party. Is your dog or cat social? Does he like being around people and other pets? Then a pet-friendly Halloween parade or costume contest could be a fun outing for the two of you. They’re everywhere this time of year: at local parks, humane societies and other venues. A word of warning, though: You need to know that your pet is comfortable and polite in public before you commit to a group gathering. A parade or costume contest is not the way to socialize a shy or fearful pet. If you are unsure about your pet’s ability to manage a crowd, do something festive at home instead. Share the treats. Make sure your dog or cat doesn’t feel ignored when you’re handing out goodies. Stock up on Halloween-themed pet treats — you can find all kinds of pumpkin-flavored, bat-shaped or, of course, bone-i-fied snacks to reward your pet. Or make your own: Pumpkin spice dog biscuits (use plain canned pumpkin rather than the pie filling and add some flair with bone- or ghost-shaped cookie cutters) or slices of apple spread with peanut butter, plain yogurt or squeeze cheese are sure to be a hit with dogs. When costumed kids or party guests come calling, reward your pet for doing tricks or sitting quietly when the doorbell rings. Allow him to opt out. Less social pets may prefer to skip trick-or-treat in favor of some quiet time in a pet-safe room. You can still make this a party: Treat him when he’s getting settled in, and then visit periodically throughout the evening to reward him with more treats and some one-on-one attention. And keep in mind that even if your pet is a party animal, he may be spooked by people in costume. If your friends want to say hi to him, be sure they take off their masks first. Keep it safe. Keep candy — especially anything containing chocolate or xylitol — well out of reach, so your pet isn’t tempted to take snacking into his own paws. This also holds true for Halloween decorations, such as fake eyeballs and cobwebs, glow sticks and potpourri, all of which can pose a risk to your pet if ingested. And finally, make sure your pet has visible identification, including a collar and tag, plus a microchip with current contact information, in case he escapes your house or yard and goes roaming with the goblins.